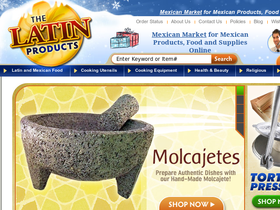 TheLatinProducts.com is a nationwide online latin store for authentic Latin products and Mexican Food. Lowest price and best selection of products guaranteed. Today, The Latin Product offers more than 1,600 specialty items from imported and national leading latin food brands. TheLatinProducts.com performs the fulfillment of groceries in it's distribution center located in Georgia and USPS/FedEx ensures expedient, reliable delivery of all orders nationwide. At 58coupons you'll find the best promotions, coupons and discounts to save on your next order from thelatinproducts.com. Shop at The Latin Products and enjoy free shipping on orders over $99. Follow this link to get started. The Latin Products offers select items at savings of up to 25% off. Visit the site today and buy before supplies are gone. Save 15% on anything at The Latin Products when you use this code at checkout. Click link and start shopping. Enjoy 5% discount on all orders from The Latin Products with this promo code. Follow link and save today.